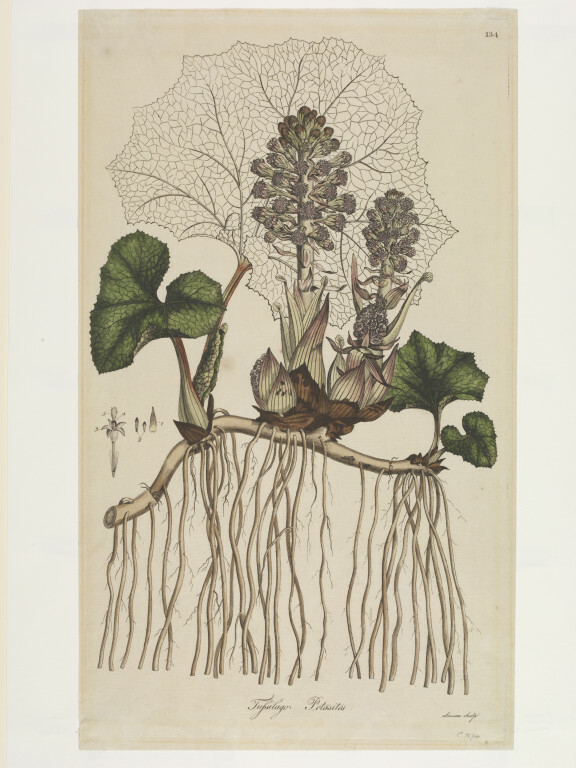 John Ruskin singled out this plate for special praise in his work Prosepina: Studies of Wayside Flowers (1888). William Curtis's Flora Londinensis was a field guide to the wild flowers growing within ten miles of London and a personal passion of his. The book was a commercial failure, but the plates were remarkable for their hand-colouring. 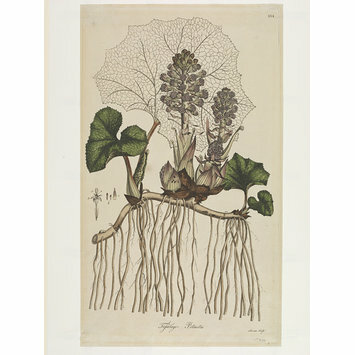 However, one subscriber to the book, Sir Thomas Frankland, wrote to Curtis criticising the opaque colouring because it often obscured the botanical detail. This plate has been coloured except for a single large leaf at the back. Had colour been applied to this leaf then the flower-heads in front would have been less easy to see. Curtis was a botanist who worked at the Chelsea Physic Garden and then established the London Botanic Garden at Lambeth. He later found commercial success with the Botanical Magazine from 1787, for which Francis Sansom became the principle engraver. Curtis, William. Flora Londinensis. London, 1777-1798.